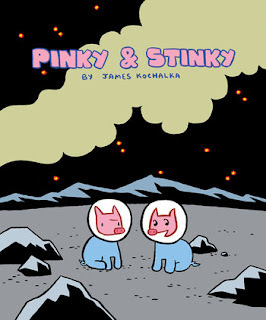 Pigs in space is not an entirely new concept in children's entertainment, but Pinky and Stinky do it in an incredibly cute and fun manner. The plot is relatively easy to follow though full of twists: they are two pig astronauts on a mission to Pluto. Due to a mishap (Stinky's fault, according to Pinky), they end up crash landing on the Moon. Luckily for them, there is a base there for them to find help, but unfortunately, the astronauts there are pretty mean and rude. Also, there are aliens on the moon who also make life interesting. Pinky & Stinky is the work of prolific cartoonist, James Kochalka. Kochalka has won multiple Ignatz Awards as well as a Harvey Award, and he is the first person ever named Cartoonist Laureate for a US state (Vermont). He creates a daily, online, diary comic American Elf and has published a wide array of comics for all age groups, mostly through Top Shelf Productions. This interview casts some light on his life and work. Like much of Kochalka's work, this book has been well reviewed. Johanna Draper Carlson called it "an imaginative journey, reminiscent of a children’s story told over several nights." Mark Allen thought it was longer than a typical children's story but concluded that "this is a very good book for children." Paul Debraski wrote that he enjoyed the humor and twists in the story as well as Kochalka's deceptively simple art. A preview is available here from Top Shelf. 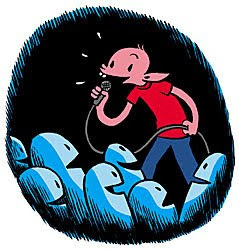 Greg Burgas at Comics Should Be Good has a nice, thoughtful review about Nick Bertozzi's latest book I recently posted about. Go check it out! Happy 44th Birthday, James Kochalka! James Kochalka is a Rennaissance man: comics artist, teacher, writer, and rock star. On top of these pursuits, he is also Vermont's Cartoonist Laureate (serving from 2011 to 2013). He is a prolific cartoonist who has produced a daily diary comic since 1998. He publishes it on his website American Elf, and print copies are available from Top Shelf Productions as The Sketchbook Diaries and American Elf. He has also created a wide range of books, including series for children (Johnny Boo, The Best Little Ghost in the World and Dragon Puncher), the iconic Monkey Versus Robots books, the raucous superhero parody SuperF*ckers, books about comics like Conversation, and The Cute Manifesto, a philosophical look at life and art. On top of all this work, he has also released nine albums with his group James Kochalka Superstar. Kochalka is not just prolific; he's also good. 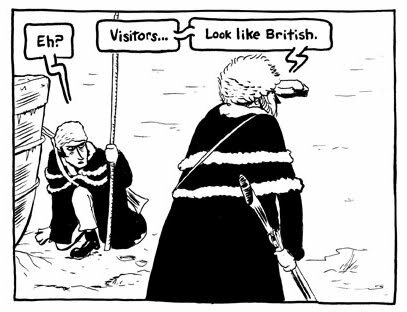 He has won four Ignatz Awards and a Harvey Award for Best Online Comics Work. He is totally deserving of a great fan blog, Kochalkaholic! Weathercraft is a 100-page long journey into Jim Woodring's dreamlike world, and the book practically defies description. The all but wordless tale may be read as a philosophical or spiritual journey. It mostly follows the plights of Manhog, a pig/man hybrid who lives in a rubbish pile and is ruled by his basest appetites. He encounters many strange creatures in this tale, including devils, carnivores, paisley-shaped critters, and Frank, a cartoon animal who resembles a dog or a bear. In this world creatures typically eat or are eaten; they go through transformations, see visions, are imprisoned, and are magically transported across time and space. Over the course of the strange and fantastical events a kind of logic starts to emerge. Jim Woodring is a Seattle artist who has been drawing comics for decades now. He gained some notoriety lately for making a functional, seven-foot-long ink pen. He is best known for his independent comics series Jim which featured the adventures of Frank. He won two Harvey Awards in 1993 for his work on the series. He also won the Inkpot Award in 2008. This interview with the Onion AV Club as well as this one with Shaun Manning lend insight into his work on Weathercraft. Woodring's first graphic novel has been almost universally praised. Reviewer Jason Michelitch wrote that "Weathercraft paints small moments of beauty and mystery on a huge canvas of twisted wonder. If you've never ventured into the deranged world of Woodring, take it from a belated first-timer that this book is as good a starting place as any." Henry Chamberlain and Brian Heater also have great things to say in their detailed reviews of the book. A video preview is provided here from the book's publisher Fantagraphics. They also provide a great number of links and images here. Congratulations to Geoffrey Canada and Jamar Nicholas (pictured above) for winning 3 Glyph Awards for their graphic novel, Fist Stick Knife Gun. Meriwether Lewis and William Clark were two Virginians selected by President Thomas Jefferson to explore, study, and chart territory across the North American continent, including the newly acquired Louisiana Territory and the contested Oregon Country. Their exploits have long been considered classic tales of American heroism and exploration. This graphic novel puts a very human face on their journey, showing their interactions with local politicians, various Native American clans and tribes who have their own agendas, trappers, British, and Spaniards. The author shows them dealing with obstacles, difficult terrain, flatulence, in-fighting, and their necessarily Spartan regimen. These various events are told in episodic fashion, with dates and labels helping make sense of what happened when. This beautifully rendered book is the work of Nick Bertozzi, a prolific comics creator who is best known for his graphic novel about the major players in the Modernist scene in Paris, The Salon, his art in the Houdini: The Handcuff King graphic novel, and his series Rubber Necker. That last work won 2003 Harvey and Ignatz Awards, and he was also awarded the Harvey for Best New Talent. 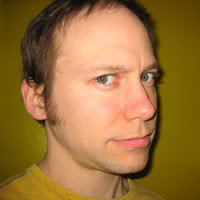 Bertozzi also regularly contributes comics to the online Act-i-vate. He describes his artistic process in this entry from the Drawing Words and Writing Pictures blog. 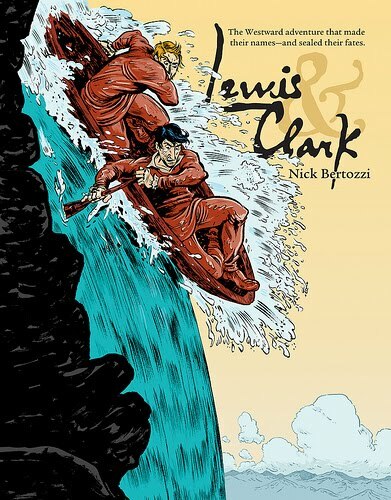 Like much of Bertozzi's work, this graphic novel has been extremely well received. Beth Hewitt praises the book, citing Bertozzi's great craft in navigating the chronology of events and capturing the voices and personalities of historic figures. The Comics Journal's Rob Clough called the book "a clever, well-crafted and exciting mainstream story with a number of deeper flourishes" and also applauded Bertozzi's ability to make deceptively simple-looking work. The Graphic Novel Reporter wrote that it is "an intimate tale of a great American epic." A preview is available here from the book's publisher, First Second. More information and reviews, including one from famed documentarian Ken Burns is available here. This gorgeously drawn graphic novel is part fairy tale, sci-fi story, mystery, and adventure yarn. And I warn you now, my description is not going to do it justice. The story takes place on the world of Anorev, where not many people live. Those who do live there are only children under age eleven. Clocks do not work; books are not read but used for stacking into rudimentary ladders. There are robots living underground, a giant angel statue looming over town, and a curious boy named Ayden, who is the only one who wonders why the world is the way it is. His curiosity leads him to question why time has stopped , and his actions bring about the arrival of 314 very dapper men who can fly and who have both mysterious motives and some answers. Jim McCann and Janet Lee created this book. McCann, the author, began his career writing for music videos, television, and theater, and he also has written a series of comics about Hawkeye and Mockingbird for Marvel Comics. Lee is an artist who lives and works in Nashville; she has shown her artwork in galleries across the world. This interview with both creators casts light on how this collaboration came about. Like fashion icon Tim Gunn, who wrote the introduction, most reviewers are impressed with this book. Comic Book Resources' Doug Zawisza celebrated it, writing that it reminds him "of everything comics can be." Reviewer Jonathan Pilley "can't recommend it enough, whether you're a young child with a robot friend or an adult who needs a reminder that even the innocence of childhood is fraught with grown-up decisions." Jill Pantozzi gushed about the book, calling it "a fairytale for a new generation." Tim Gunn's introduction is available here from the book's publisher Archaia. A video preview is available here. Book two follows the adventures of Portia, Jellaby, and Jason as they venture into Toronto to find a way for Jellaby to get home. Along the way they learn to navigate transit systems and traffic and come to an amusement park. There they take rides, run into a tough trio of kids, and also encounter a mysterious masked stranger who seems to know a lot about where Jellaby is from. A major threat also arises, threatening their lives and friendships, making them question who they can trust. 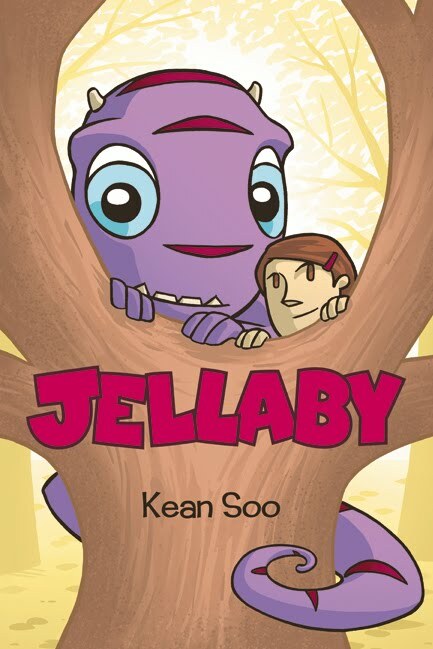 This second book from Kean Soo, a cartoonist who started publishing stories about Jellaby in the Flight anthologies and who posts his work online at The Secret Friend Society, goes beyond their initial encounters and focuses on how being friends with a little dragon might play out. Reviewer Dave Ferraro was disappointed by how this focus worked and hopes that Soo "will return the character to his playful roots." 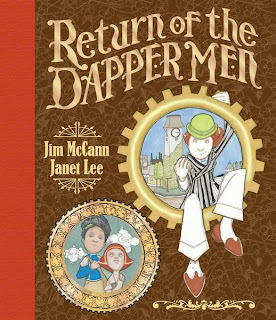 The School Library Journal's Ernie Cox differs in opinion and felt the book would be a strong contender for the Caldecott Award. 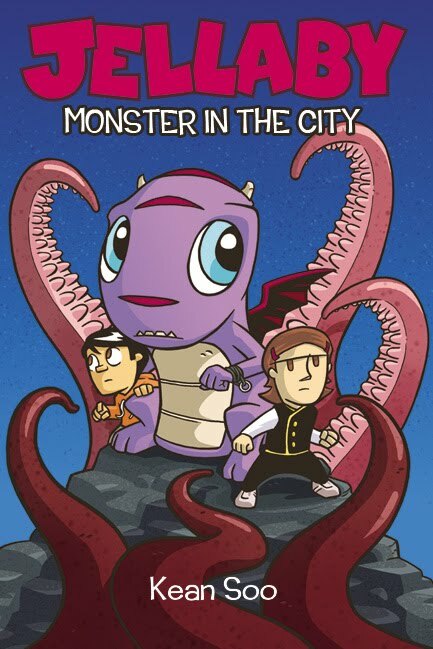 The School Library Journal also put this book on their Best Comics for Kids 2009 list. Although volume one is still out of print, this one is still available from Disney Hyperion. A preview is available here from the author. Ten-year-old Portia is having a tough time adjusting to her new neighborhood, life at home without her father, and the kids at school who give her a hard time. Complicating things even more, she happens upon a giant purple monster in her backyard, though the monster is not so scary (aside from trying to eat her flashlight, that is). She starts an unlikely friendship with Jellaby and strives to keep the monster a secret. That does not last long when a lonely little boy named Jason starts snooping around. This book is charming, fantastical, and yet firmly grounded in reality, with very real life circumstances and well-defined characters. 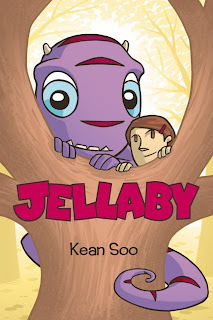 It is the creation of Kean Soo, a Canadian-Asian artist who began the story as a webcomic at The Secret Friend Society, a site run jointly with his artist colleague Hope Larson. Soo does not have many credits in comics as of yet, but he publishes frequently in Flight, where Jellaby first appeared. This interview contains lots of information about his life and work. Jellaby is a book that has much to offer readers of many ages. Esther Keller was impressed with Soo's craft, noting that "the art and story work together seamlessly, so that the reader will have to read the pictures as well as the words to get a full story – and all the jokes." Michael Jung praised the book, writing that "with his oversized head, huge mouth, and expressive eyes that seem simultaneously naïve and intelligent, Jellaby is a monster any kid (or adult) would fall in love with." J. Caleb Mozzocco added, "This is a great little suburban adventure story that I'd recommend to just about anyone of any age." Personally, I very much enjoyed the book and was extremely disappointed when I came to the end and found I had to wait for a sequel. Luckily, the sequel is out now, but there is also bad news. This first book is now out of print, but the first 64 pages, as well as a few short stories can be found here from the webcomic site.